SONY BDP-SX910 PORTABLE REGION FREE BLU-RAY DVD PLAYER BLU-RAY ZONE A, B, C & DVD: 0 1 2 3 4 5 6 7 8 PAL/NTSC 100-240V 50/60HZ AUTO. PAL/NTSC Converter Works on all TVs with HDMi connection. LCD Screen: The Sony BDP-SX910's built-in 9 (diagonal) TFT active matrix widescreen LCD panel features a resolution of 800 x 480. The LCD screen can open up all the way to 180°, and, at 90°, it can swivel 180° left and right so you can view your movies from any angle. The unit has an HDMI output for connecting it to an external HDTV. Dolby Digital plus Decoding : Yes. LPCM : Yes 2ch (192kHz/96kHz/48kHz) out (on HDMI). HDMI Dolby TrueHD Bitstream Out : Yes. HDMI Audio Out/ DTS Neo:6 : Yes. HDMI LPCM 2ch (192kHz/96kHz/48kHz) Out : Yes. HDMI Dolby Digital Plus Bitstream Out : Yes. DTS HD Master Audio bit-stream out : Yes. ·Audio Features HDMI Audio Out. Bit Rate Indicator : Yes (Video/Audio). Auto Power Off (Auto Stand-by) : Yes. XMB (Xross Media Bar) : Yes. Region Code (DVD) : 1 2 3 4 5 6 7 8 PAL/NTSC. HDMI Connection Output(s) : 1. ·Photo Slide Show with Music. DVD-R Dual Layer : Yes (+VR). DVD Camcorder 8cm DVD : Yes. Bonus View (Profile1.1) : Yes. CD-R/-RW Multi Session : Yes(1st session only). BD/DVD : Yes (select in set-up menu). AVCHD Disc Format Folder : BD/DVD/CD/USB. DVD Video Output - HDMI : Via HDMI (480i/576I/480p/576P/720p/1080i/1080p 50/60Hz). BD-ROM Output - HDMI : Via HDMI (480i/576I/480p/576P/720p/1080i/1080p 50/60Hz). DVD Upscaling : Via HDMI (480i/576I/480p/576P/720p/1080i/1080p 50/60Hz). 24p True Cinema Technology : Yes. DVD-RW Read Compatibility : (480i/576I/480p/576P/720p/1080i/1080p 50/60Hz). Picture Parameter Adjustments : Yes (Backlight/Color/Contrast/HUE). 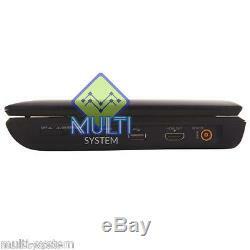 DVD-R Read Compatibility : (480i/576I/480p/576P/720p/1080i/1080p 50/60Hz). DVD+RW Read Compatibility : (480i/576I/480p/576P/720p/1080i/1080p 50/60Hz). BD-R/RE Read Compatibility : (480i/576I/480p/576P/720p/1080i/1080p 50/60Hz). Sound Modes: For enhanced listening, the BDP-SX910 has four selectable sound modes: Standard, Dynamic, Dynamic Surround, and Dialog. LCD Modes: You can adjust the LCD using the following LCD modes: LCD Aspect (Full, Normal, or Zoom), Backlight (1-20), Contrast (1-20), Hue (-10 to +10), and Color (1-20). Controls: The SX910 has a full set of controls on the LCD screen bezel. This allows you to control the unit even if you have the lid closed with the screen facing outward. Controls include individual buttons for Hold, Sound, Display, Menu, Return, and Options. There is also a 4-way control with an Enter button for confirming selections. During playback, you can easily access the Volume + and - buttons, Next and Previous (track/chapter) buttons, Play, Pause, and Stop. A slide-switch Power button is located on the right side of the unit. A/V Sync: You can adjust the gap between picture and sound between 0 and 120 milliseconds to correct any lip sync issues. Wireless Remote Control: The BDP-SX910 comes supplied with an IR wireless remote control (RMT-B113A). The player has IR sensors on the front panel of the base, and to the left of the LCD screen. You can control the player with the remote control with the LCD panel closed or open and angled in any direction. Power Sources: The BDP-SX910 comes supplied with 3 methods of powering the unit. Battery: The built-in rechargeable lithium ion battery provides approximately 4.5 hours of playback time. The charging time is approximately 4.5 hours. The battery is recharged while using the AC adapter or car battery charger, however, the battery does not charge while the player is being used. AC Adapter: The BDP-SX910 also comes supplied with the AC-FX197 AC adapter so you can use the player in your home or office. The AC adapter is also used to charge the battery when the unit is off. Car Battery Adapter: The BDP-SX910 comes supplied with the DCC-FX190 12-volt car battery adapter so you can easily power the unit in your car. The car battery adapter will also charge the battery of the player when the unit is off. Right Side Connections: The following connections are found on the right side of the unit. Headphones: A 3.5mm headphone jack for private listening. Plugging in headphones will automatically mute the built-in speakers. USB: Type A USB port for connecting a USB memory device. HDMI Out: Full-sized HDMI output for connecting the player to an HDTV or an AV receiver. DC In 12V: Power connection for use with the supplied AC adaptor or car battery adapte. This portable disc player features a 9 TFT LCD screen that rotates 180° so you can see all your favorite Blu-ray or DVD movies in stunning high resolution 800 x 480 quality. When you connect it to your 1080p HDTV, the player supports output of 1080/24p video. In addition to Blu-ray discs, this player can support playback of DVD-ROM, DVD-R, DVD-RW, DVD+R, DVD+RW, CD-DA (Audio CD), CD-ROM, CD-R, and CD-RW. You can also enjoy popular file types like JPEG, MP3 and AVCHD to widen your options to encompass your whole collection of movies, music and photos even when you're on the go. USB Port for Music, Photo & Video Playback. The BDP-SX910 has a USB port, so you can enjoy your personal photos, videos and music files stored on a USB memory drive. That means you can also hook up your digital camera or camcorder to instantly see your photos on the high resolution 9 screen. A headphone out means you can enjoy your favorite entertainment even in noisy environments when you want to concentrate on what you're watching. Since you may want to screen what young children can watch, the BDP-SX910 offers both DVD and Blu-ray disc parental control locks, so you can decide which discs can be played back. BRAVIA Sync lets you link all compatible devices together for a simple one-push startup/shutdown process. Additionally, you can also operate these devices using just the BRAVIA remote control. This way you can simplify your entertainment experience. This disc player comes with a built-in rechargeable battery that can last up to 4.5 hours depending on usage. That means you could watch two 2-hour movies without needing to recharge. All this connectivity and interactivity is packed into an ultra-portable unit that folds up to fit into a bag for use while traveling. Its small size and rechargeable battery make it easy for you to enjoy your favorite entertainment wherever you go. SONY BDP-SX910 Region Free Blu-ray Portable Player. Papers / Instructions / Manual. The high-definition 9-inch LCD screen swivels 180 degrees, so you can find the perfect viewing angle in any setting. Use it as a TV/Blu-ray combo in your bedroom. Or hook it up to your HDTV via the HDMI output for use as a stand-alone player to deliver sharp, 1080p images to your big screen. The BDP-SX910 plays DVDs and CDs as well as Blu-ray discs. It will even make old DVDs look better with video upconversion. Insert a thumb drive into the USB port for viewing photos and home videos, or listen to MP3s through the built-in speaker or the headphone jack. Convenient, intuitive touch keys on the screen frame give you easy control of the player's function when the included remote is out of reach. When the show is over, just flip down the screen and you're ready to take it on your next getaway If you want the features and high quality image processing of a Blu-ray player in a portable package, the Sony BDP-SX910 9 Portable Blu-ray Disc/DVD Player is a rewarding choice. You can enjoy Blu-ray and standard DVD movies on its 9 LCD screen in brilliant WVGA (800 x 480) resolution. Weighing in at just shy of three pounds, its lightweight size makes it a great travelling companion. We are the largest distributor of Multi Region All Zone DVD and Blu Ray Players, using our advanced HD-ICOS enhancements. We carry all models and all brands includes Multi Zone Blu Ray Players and Region Free DVD Players, Recorders, Portable DVD Players, ALL ZONE Home Theater Systems, Multi System TVs and more. There are many sellers out there, but none of them will give you LIFETIME Region Free Guarantee for the life of the player. Do not settle for cheap imitations just to save few dollars look at our feedback. International orders are charged at the time the order is placed. The return of the product is at your expense. Your privacy is important to us. We strive to exceed your expectations for privacy. The item "SONY BDP-SX910 PORTABLE REGION FREE BLU-RAY DVD PLAYER ZONE A, B, C & DVD 0-9" is in sale since Tuesday, April 07, 2015. 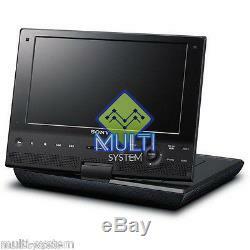 This item is in the category "Consumer Electronics\TV, Video & Home Audio\DVD & Blu-ray Players". 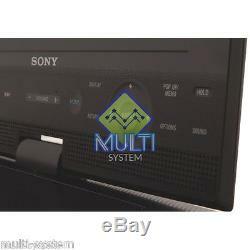 The seller is "multi-system" and is located in Chicago, Illinois. This item can be shipped worldwide.